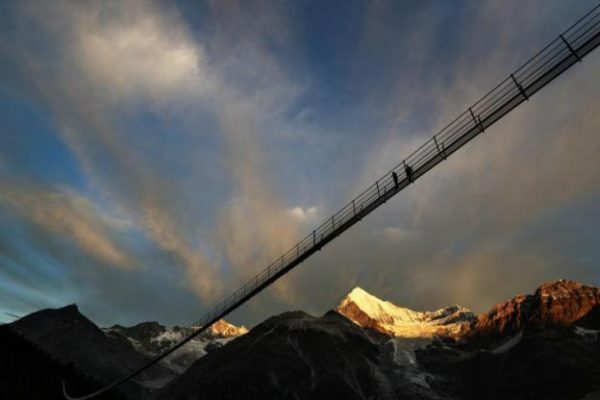 A 1,640ft bridge for hikers billed as the longest hanging pedestrian bridge in the world has opened near Zermatt, Switzerland. The new bridge replaces a previous one that had been damaged by rock falls. The Europe Bridge, whose cables weigh about eight tonnes, is equipped with a system to prevent it from swinging, the Zermatt Tourist Board said. The new bridge forms part of a two-day hiking route between Zermatt and Grächen in southern Switzerland with views of the Matterhorn mountain.